In the previous post in this series, I described my personal experience of an extreme misogi water purification ritual performed in Kikonai in Northern Japan. 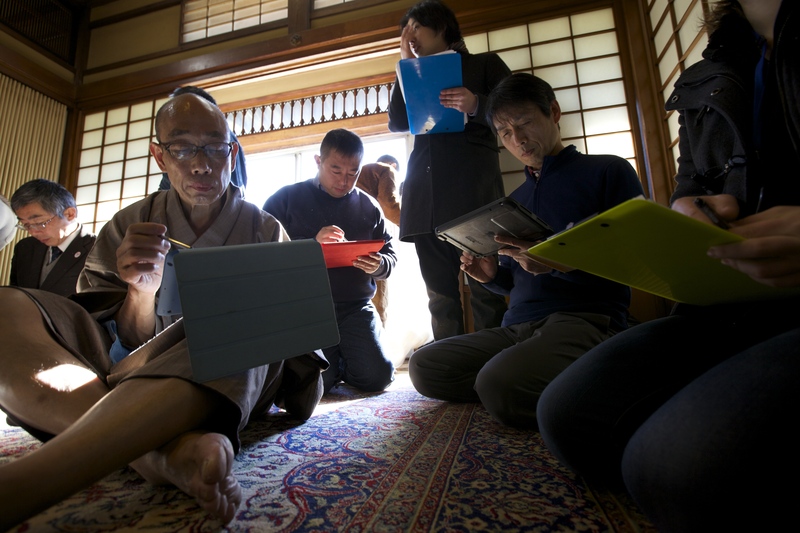 In this post, I will continue that discussion and recount an altogether different experience I had more recently (about one month ago) at another misogi event, this time held at Teppozu Inari a Shinto shrine located in a suburb of central Tōkyō. 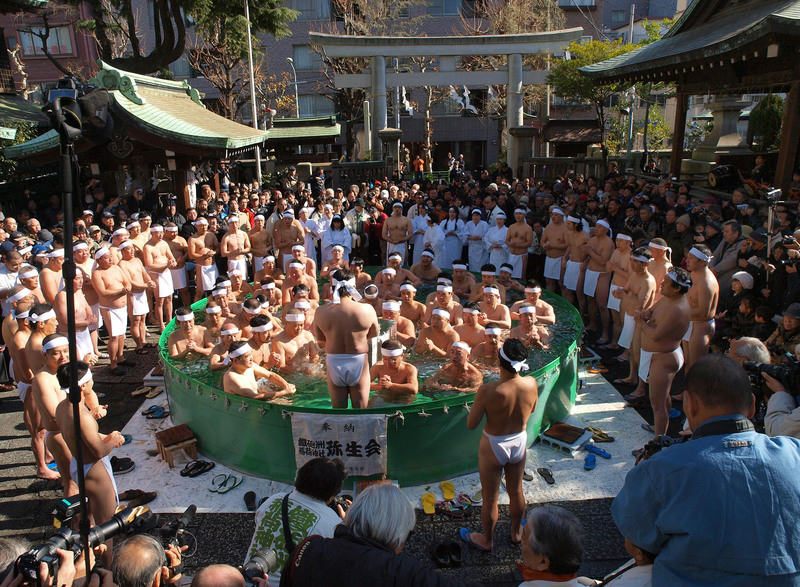 In certain respects the ritual event in Tōkyō followed a similar format to that of the event in Kikonai; again there were musical performances, local volunteers provided servings of hot soup and a crowd of expectant observers watched a smaller group of hesitant looking misogi performers purify themselves with ice cold water. There were, however, a number of important differences. First, unlike at Kikonai, the performers were not being splashed with buckets of water, instead they climbed and then squatted down in a large pool of icy water (complete with floating blocks of ice). Second, the misogi was only being performed for a single forty minute session; this was not the three day ordeal of Kikonai. Third, as opposed to four young boys, the performers in Tōkyō were made up of a group of around 100 people, the majority of whom were middle aged men (and unlike Kikonai there were also a few women participating). Fourth, it was significantly warmer. While Tōkyō in the winter is not what one would describe as ‘warm’, it is a far cry from the -15 degree temperatures and falling snow of Kikonai (on the day of the misogi in Tokyo the sun even kindly made a brief appearance). Fifth, before performing the misogi all of the performers performed a series of synchronised ritual ‘exercises’ (described here), while simultaneously chanting together loudly. And finally, whereas the Kikonai festival was held in a small, relatively remote town in Hokkaidō, the Tokyo event was held at a shrine in central Tōkyō, located in an area only a few stops away from the central Tōkyō train station. The synchronised ‘exercises’ before the misogi. Image from reuters. There are other points of departure but the ones above are the most significant and combine to create a misogi event with a substantially different atmosphere and function than the event in Kikonai. Specifically, while both events contain the sense that the spiritual merit from the performances will extend to the wider community- in Kikonai to produce a successful year of fishing and in Tōkyō to help purify the sick and weak members of the community- it was at the latter location that this purpose seemed to be most strongly emphasised. During interviews and informal discussions the shrine priest at Teppozu Inari and other local leaders were emphatic that their ritual was not about displaying individual fortitude, but was a collective act performed by the healthy on behalf of those in the community who were physically incapable of participating. This might be the normative interpretation, but I also experienced some personal evidence in support of this interpretation when a local resident, who was wheelchair bound, came up to express their appreciation to me for taking part. 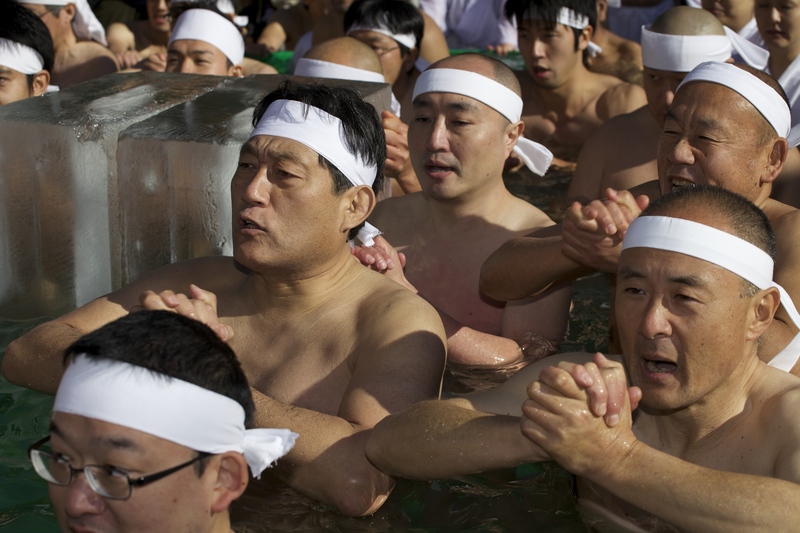 The shrine priest also explicitly contrasted the ritual with other events like the Polar Plunges held in North America, noting that such events tend to focus on the individual challenge of enduring the cold water, while the emphasis here was squarely on the community. To be clear though the distinction is simply in the degree of emphasis as in Kikonai the misogi event also included many references to the wider community and there was substantial involvement from community members; with plenty of processions, musical performances, stalls providing local produce/products and even a sizeable entertainment festival organised in the town centre. However, the fact that participation in the misogi proper in Kikonai is restricted to young, unmarried boys and the extremity of the ordeal faced, means that inevitably there is a stronger emphasis on the individual performers. It is also clear that the ritual serves as a rite-of-passage to adulthood with most of the locals that we spoke to agreeing that the boys who participate increase their local status (as some people termed it becoming heroes). However, when I raised the elevated status point with one of the young performers, they laughed and said that any possible status increase, especially with women, would be limited to Kikonai and that this would be of little benefit when they were moving to work in Tōkyō. In response I helpfully suggested that they could carry pictures of the event to show potential love interests in Tōkyō but the performer astutely noted that this was likely to cause irreparable damage to any budding romance. While we were joking, the performer’s comment does actually raise an interesting theoretical issue for certain costly signalling theories of extreme rituals. Such theories suggest that individuals incur a cost (e.g. performing a painful misogi) in order to a) signal their fitness and increase their attractiveness to potential mates and/or b) to provide a ‘hard to fake’ signal of commitment to a group and thus gain access to desirable group resources and elevated status (Sosis & Alcorta, 2003). The issue here though is why there would still be a strong motivation to participate in Kikonai, when the possibility of extracting benefits from female attention or group resources has been essentially removed by the (ever increasing) trends in rural-urban migration (from the 2014 group, for instance, 3 of the boys were not living in Kikonai). The answer may be that in the face of significant migration the ritual is actually in a slow process of decline (the previous years did see the first time that non-residents took part) but I saw little evidence of this. The event was clearly an important source of pride for the town and this perhaps suggests that the previous (potentially adaptive) in-group signalling function is now being subsumed by a newer out-group signalling function- as a tourist attraction. 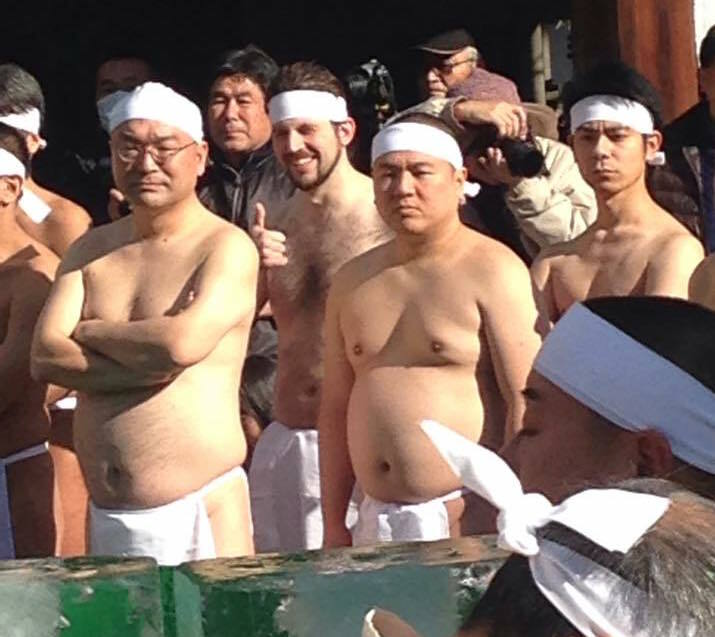 This still leaves the question of what motivates the individual boys to volunteer for a four year long ordeal/commitment, but given the general importance of the ritual to the community (it is probably Kikonai’s most famous feature), and the fact that there are clear social and financial rewards (the performers receive not insignificant donations), the survival of the event, at least in the near future, seems assured. Indeed, while there is more fluidity to ritual practices than many people would expect, local traditions can prove remarkably resilient and this is especially true in a culture like Japan, where festivals are largely detached from any rationalised beliefs or doctrines. Returning to the Tōkyō event, the misogi festival at Teppozu Inari also seems far from decline, with recent years seeing the number of participants continue to grow from around 40 or so 10 years ago to almost 100 in 2015. The participation of this many performers is all the more remarkable given that the shrine’s grounds are relatively small. Teppozu Inari is not some spacious rural mountain shrine, it is embedded right in amongst the surrounding urban sprawl of Tōkyō. In fact, the shrine’s physical structure displays some evidence of the compromises required to accommodate to such surrounding, as the characteristic sloping roof structure of one of the smaller shrine buildings abruptly cuts off against the wall of a concrete tower block looming behind the shrine. Regardless of these urban surroundings, or perhaps due to them, the community festival seems to be flourishing with the shrine managing, in addition to the performers, to pack in crowds of around 100-200 people, despite the majority of the space being taken up by the large pool of ice. Misogi performers filling in our questionnaires. Image courtesy of (and copyright owned by) Mark Moffett. Although I was there with a team to collect research, I was still able to take part in the actual misogi performance and consequently I couldn’t help making comparisons with my experience in Kikonai. I had actually worried a little beforehand that despite the higher temperture the Tōkyō misogi might be more painful than my previous experience due to: a) the surrounding air temperature being warmer than the water, which would make the water feel colder and b) being totally immersed in cold water, meaning that there would be no heated pockets of protection or means to avoid the icy chill (my armpits had remained a refuge with my crossed arms in Kikonai). 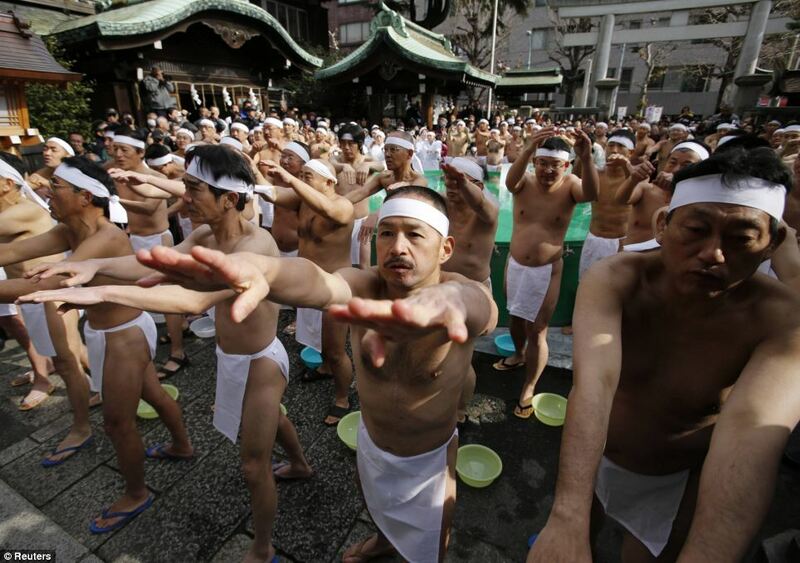 As it turned out, the misogi experience overall felt less severe than the previous event and this was in large part due to the performance of the synchronised exercises and chanting mentioned earlier (we also went for a run through the streets around the shrine- wearing only loincloths). These exercises were absent from the event in Kikonai and I think they are fundamental to establishing a different atmosphere to the ritual performance. While video footage recorded by a friend conclusively revealed that I was, by far, the least synchronised performer present, I can confidently attest that while performing the actions and the associated chants and shouts I felt in total synchrony. This sense was further enhanced by the fact that all performers were dressed in the exact same attire- a simple white loincloth and headband- and had the same shred focal point of attention, a similarly attired man facing all of the performers from an elevated stage leading the exercises and chating. I learnt afterwards that this man was from another Shrine and something of a professional ritual performer. It would be hard to overstate just how pervasive his charisma was or the atmosphere of authority created. Discussing the event afterwards with other researchers and some friends who attended, all of them mentioned the tangible atmosphere that was created by this man’s performance and the complementary reaction it instilled in the other performers. The impressive chant leader in question (centre right). Image courtesy of (and copyright owned by) Mark Moffett. A core theoretical insight of research on group psychology has been to document the conditions and implications of a process called depersonalisation. Depersonalisation, according to social identity theorists is a hydraulic process and entails the dissolution of the personal self in favour of identification with a collective group category. This process can have negative consequences by lessening the sense of individual accountability (with lynch mobs offering a paradigmatic example) but it can also be channelled into establishing positive affect and camaraderie, as was the case at this misogi. 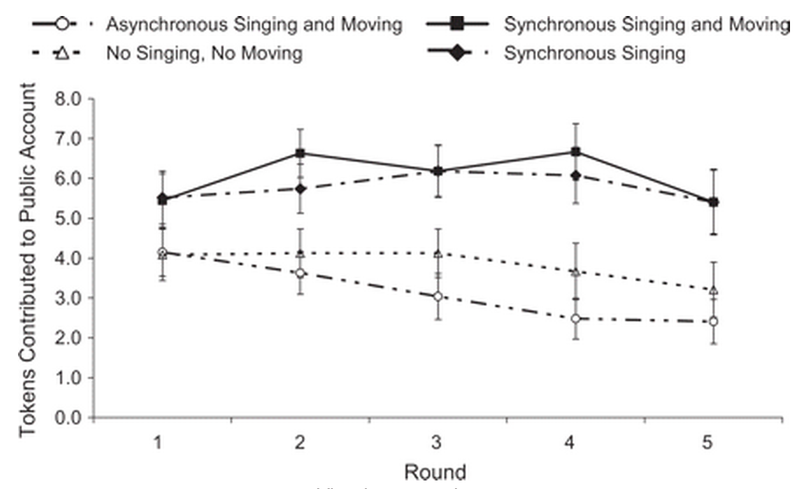 A 2009 study by Wiltermuth & Heath demonstrated that this effect was strong enough to be replicated even under artificial laboratory settings, as groups of strangers displayed greater levels of cooperation in an economic game in conditions were they performed synchronous acts (singing and moving) together. Cooperation levels during a five round economic game. From Wiltermuth & Heath (2009). I remain somewhat sceptical of how far depersonalisation alone can account for group behaviour and I agree with the critiques from psychologists such as Masaki Yuki and Bill Swann that there are forms of group psychology that do not entail depersonalisation and instead rely on intensely relational, personalised bonds. But my experience at the Teppozu Inari shrine reminded me of just how powerful synchronous (or at least perceived) synchronous performance can be. As the only hairy caucasian taking part in the misogi I was by definition an outgroup member, and well aware of this fact and the distancing that comes with my role as a researcher, and yet completely unexpectedly during the time that we stood chanting and performing the rhythmic movements together I felt not like a pretender but an actual member of the group. This suggests to me that reacting to shared identity markers and synchronous performance is a deeply rooted element of our coalitional psychology… or that I am easily deluded! I’d read this shortly after you posted it(I’ve been more than a bit preoccupied since the end of last year) – glad to have reread both pieces having just come across social identity theory in other reading recently.